Had a great time at the Odawa Casino in Petoskey, Michigan. I did the design to welcome the incoming President. Beforehand, when I first agreed to do the design, I ask the incoming president what she liked, and she said something natural and woodsy. The wood is an old apple tree trunk. My inspiration was lake water on the shoreline. It is very traditional in concept, and not woodsy, but she liked it and that’s what counts. 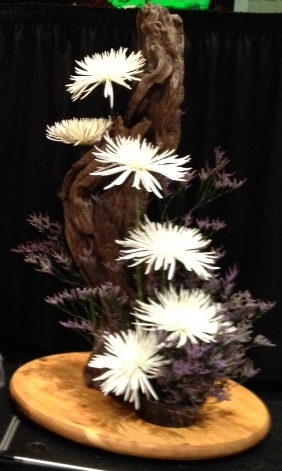 Ingredients: old piece of wood, cleaned and varnished, spider mums, and Limonium altaica (altaica statice).